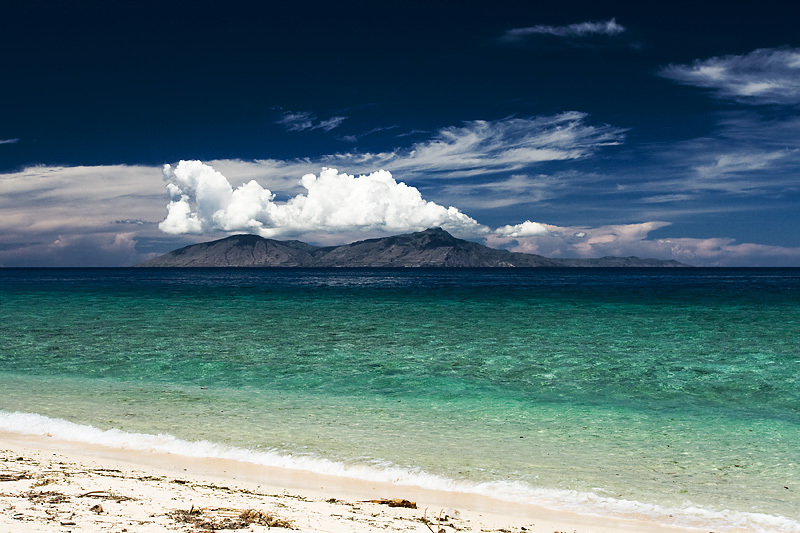 An island off the coast of East Timor's capitol, Dili. I always recall, each year just after Halloween, the weather turns bitter cold and the hopeless feeling of knowing I'm putting my shorts away, not to be worn until several months later. For many of you in the northern hemisphere, that time is now. Let me assure you, as I bask in the warm sun here in India, I suffer your pain in spirit :o). 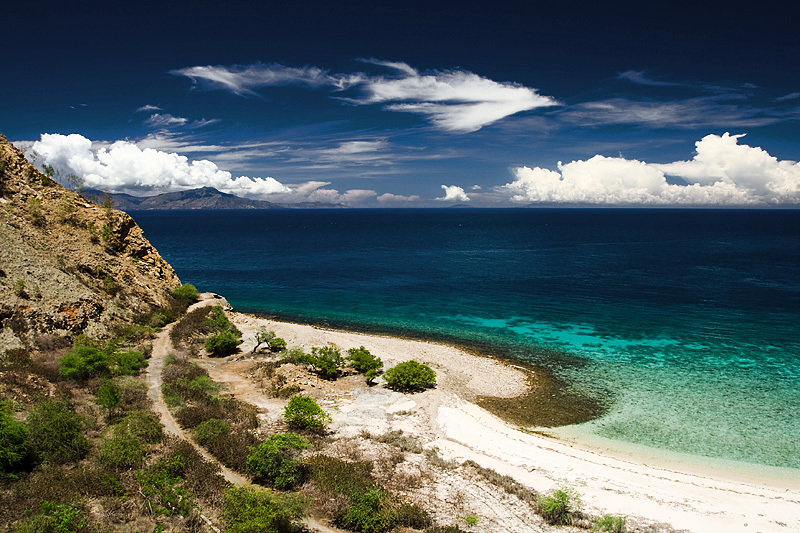 So allow me to present some warm weather photos taken from the idyllic coastline of East Timor. And for those of you that actually enjoy winter, I ask, "what's wrong with you!?" French traveler, "Frenchie" fumbles with his snorkeling equipment in some of the clearest waters in Southeast Asia. At the time we were in East Timor, they were suffering a tumultuous period in their early nationhood. Gang violence, factional army infighting, and a burgeoning refugee crisis had the nation perilously close to becoming a failed state. NGOs and UN organizations, for whatever they're worth, seemed to outnumber small to medium sized businesses in Dili, East Timor's capitol. With the chaos, tourism simply ceased and therefore tourist infrastructure was never built. The small issue with these perfect beaches, in my opinion, was the lack of facilities. A trip to the beach was always a major production. We'd have to bring everything from water to snacks. Because of the poor public transportation in Dili, it was even a chore to get out here and were it not for us befriending the one guest at the hotel that owned a car, we'd rarely have made it out for a leisurely dip. Call me a package tourist but I prefer a nice snack hut on the beach where I can order a refreshing Diet Coke and sit in the shade of a bamboo hut with thatched roofing avoiding third degree burns from a scorching sun. I'd prefer to not have to bring a sack lunch. Ultimately, a paradise like this is bound to be exploited. Soon enough I'll regret my words as that bamboo hut diversifies into expensive concrete hotel rooms, para-sailing tours and the bane of over-commercialized beaches: jet-skis rented by pasty overweight Europeans wearing incredibly tight Speedos that leave little to the imagination. Ibiza was ruined this very way. A climb to the top of the hill behind the beach provides a stunning vista of the untouched clear & turquoise waters below. 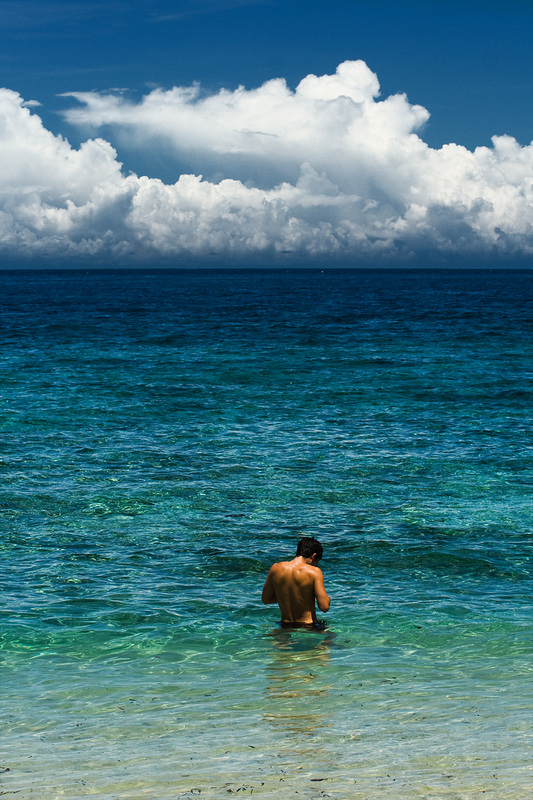 Swimming in untouched tropical waters frightens me. Who knows what kind of man-eating water monster lurks in these untested depths and how many local fishermen have been eaten to death despite their valiant struggles to free their leg from the monster's sharp teeth. On land, a person's chances of survival when being chased by a mob increases exponentially when he is, at minimum, the second slowest member of the group. The slowest runner will likely be caught and the blood thirsty mob will feast on his blood and have their way with the lifeless corpse (unless the slowest runner is clever and trips another member of the group). Likewise, in a given swimming group, my chance of being eaten decreases exponentially if one of the other group members looks a bit more overweight and delicious than I do. Due to my inactivity of recent months, I'm afraid I'm the most delicious and overweight appearing in any given group. Hence, I stay in the shallows and splash around like a toddler waiting for the chance to scold, "I told you not to swim out so far in untouched waters." 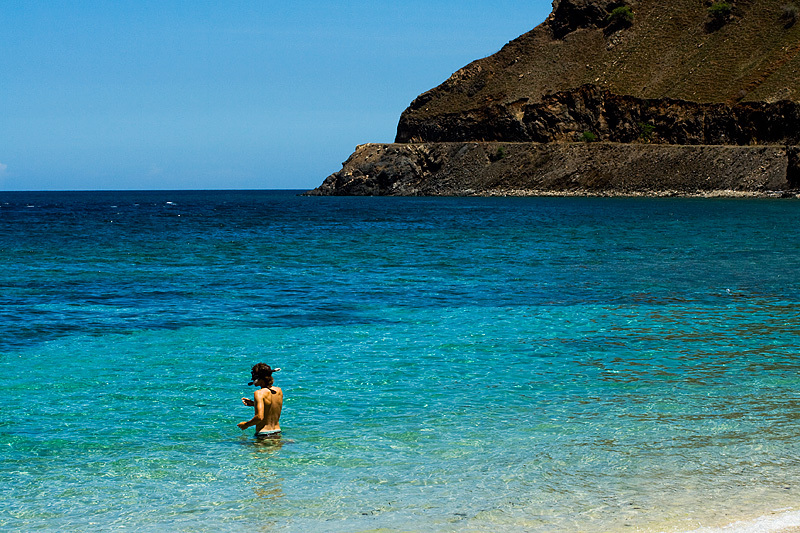 A Kiwi graduate student, in East Timor for research, wades into gorgeous waters in preparation to snorkel. Thank goodness we befriended this guy. He had access to a truck that fit all of us to go on day trips here and there. For all you college freshmen that haven't learned this lesson, make sure you befriend that rich kid whose parents bought him a car to drive at school, especially if he's a non-drinker! God's gift to college students is a permanent designated driver! Hi There, amazing photos of the Timor-Leste coastline, wondering if it is possible to get large format versions of your photos (or large prints)?